We’ve been keeping tabs on the DOJ’s evolving policy on charging federal drug offenses (see past posts, here and here), and it appears that Attorney General Eric Holder is indeed keeping his promise of instituting charging policies that focus on high-level criminals as well as rehabilitation. As part of those “Smart on Crime” efforts, the attorney general this past week announced a new policy making it easier for some drug defendants to obtain shorter sentences. The Huffington Post is reporting that number of defendants charged with federal drug crimes in January dropped to its lowest monthly level in nearly 14 years, not long after AG Holder established a series of changes to the criminal justice system. The latest statistics, compiled by Syracuse University’s TRAC program, indicate that the number of defendants charged with drug offenses during the six-month period from August through January is the lowest six-month total since the end of the Reagan administration. 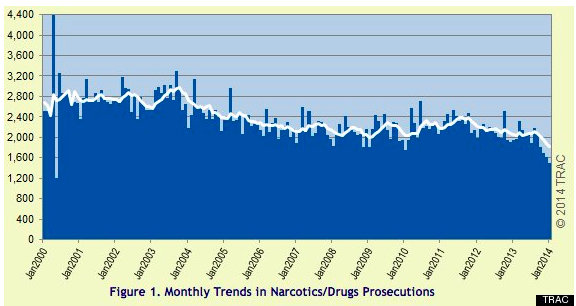 Specifically, in January 2014, there were 1,487 new drug prosecutions, down 7.8 percent from December and down 11.5 percent from January 2013, according to the TRAC report. It will be interesting to see how the Smart in Crime initiative will affect communities like Okeechobee County, FL and whether data will show a decrease in drug arrests there, too. If you have been charged with a federal drug crime in Okeechobee or anywhere in South Florida, the Okeechobee Drug Crime Attorneys at Whittel & Melton are available 24 hours a day to asnwer questions and provide you with seasoned legal advice. Call us today to discuss your case. LOCAL (561) 367-8777 OR STATEWIDE, TOLL FREE: (866) 608-5529.